The American cuisine is not only burgers and hot dogs. Here are addresses that offer more elaborate dishes with quality products and balanced menus. Try the American Beef ! Located in the East Village, the Cloister Cafe brings you back to the medieval times : the main dining room showcases several original high impact stained glass windows. But the menu features seasonal american food with exotic touches from Thailand. The stass is using only ingredients from the Union Square Greenmarket. In 1926, at the time of the prohibition, Frankie and Johnnie's was a secret place. The customers had to give a password ("Frankie" or "Johnnie") to access the restaurant through a back door... Of course, times has changed now. 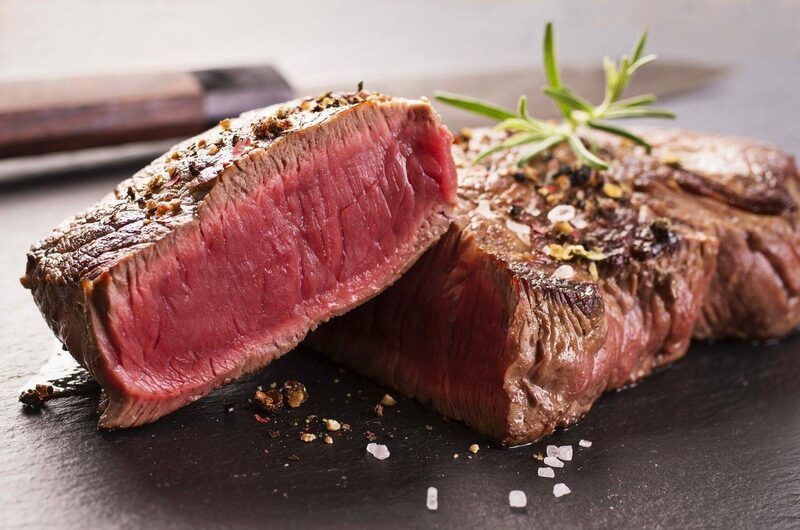 But Frankie & Johnnie's Steakhouse still have regulars clients and tourists who come to taste steaks, ribs or T-Bones, à la carte or according to the menu. Note that the restaurant has two addresses in New York. 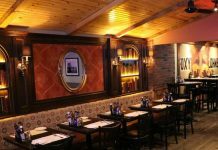 Located in the Hell’s Kitchen District, Georgio’s Country Grill brings you to the countryside with brick walls and colorful murals. The menu features lamb chops, grilled ribs, steak and BBQ chicken. You can also order pastas, pizzas, burgers and salads. For your dessert, ask for the cake of the day or the classic country apple pie. Note that Georgio’s also serves breakfast all day and brunch on week-ends. Founded in 1925, Lexington Candy Shop has never changed ! Ask for your hamburger with french fries. And don't forget the ketchup ! 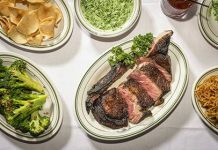 Located in the heart of Midtown Manhattan, Charlie Palmer Steak New York is a modern American steakhouse founded by the chef Charlie Palmer. The menu features american recipes like the Ceasar salad, burgers and ribeye. Note that the menu depends on the season and that all the products come from surrounding Northeast and Mid-Atlantic waterways and farmlands. Founded in 1995 in the Chelsea/Flatiron area, The Hog Pit NYC brings the southern cuisine in New York City. The menu proposes you a wide selection of tacos, salads and burgers. Try for exemple the Chichen Bacon Ranch and ask for more toppings. And don't forget the Hog Pit motto : "eat well, drink a lot !" 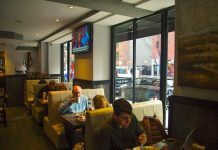 Located in the Hell's Kitchen District, just 3 blocks from Times Square, this brand new restaurant opened in september 2013. The concept is simple : make the farm-to-table experience casual, interesting and fun. The chef uses seasonal ingredients and the menu changes everyday. Check out their website to see the menu ! 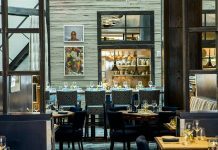 Founded in 2016 near the Flatiron Building and the Madison Square Park, Tivoli Cafe is a family restaurant featuring american cuisine in a contemporary atmosphere. On the menu: burgers, salads, meats, pastas... Don't forget also the specialty of the house: grilled chicken. For you dessert, you will hesitate between cheese cake, fudge, brownie or carrot cake.